The more I learn about other cultures, the more I learn how similar we all are. Food is one of the best ways (if not THE best way) to get to know another culture. And as always with this blog, I am trying to experiment and broaden my own horizons as I try to share with my readers a different way to approach a new recipe. The latest fabulous step in my culinary adventures took place a few days ago when my friends at Urban India in downtown San Diego agreed to let me hang out in their kitchen for a little while to learn the basics. Co-owner and occasional chef Surinder Singh promised to show me how to cook one of my favorite dishes, and to give me the lowdown on curries and sauces. I should point out that the entire time I was there, I never saw anyone measure anything. Surinder made it clear that it wasn’t necessary. But as we went along, I noticed striking similarities with the way Indian food is cooked and the way … well, the way everyone cooks. I nodded. He was speakin’ my language. This is how billions of dinners worldwide begin every day. 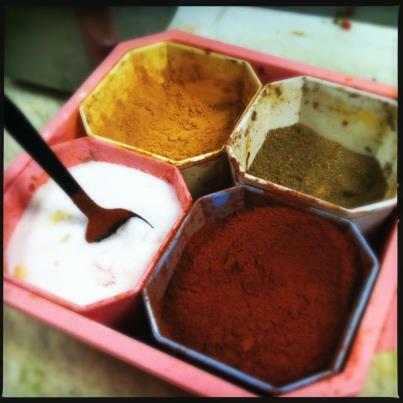 Clockwise from bottom right: pepper, salt, turmeric, and house blend of spices. I kept nodding. This is what I’m talking about. Everyone has a house spice, right? (If you don’t, get one. You probably already have 3 or 4 spices you use in nearly every dish you cook. You’re halfway there.) Surinder wouldn’t divulge the contents of his mystery house spice that goes into every dish, but my nose told me it involved caron, coriander, cumin, mustard, thyme and possibly anise or clove. From that point on, the specific spices, levels of heat and ingredients for each recipe greatly diverge, so we started making my favorite Indian dish: gobi manchurian. Due to religious restrictions – about 90% of India’s population is Hindu or Muslim – it’s nearly impossible to find a beef or pork dish on an Indian menu. All of the meat dishes involve chicken, lamb or goat, and the vast majority of Indian dishes have no meat at all. Not that you’d miss the meat when it comes to dishes like this. 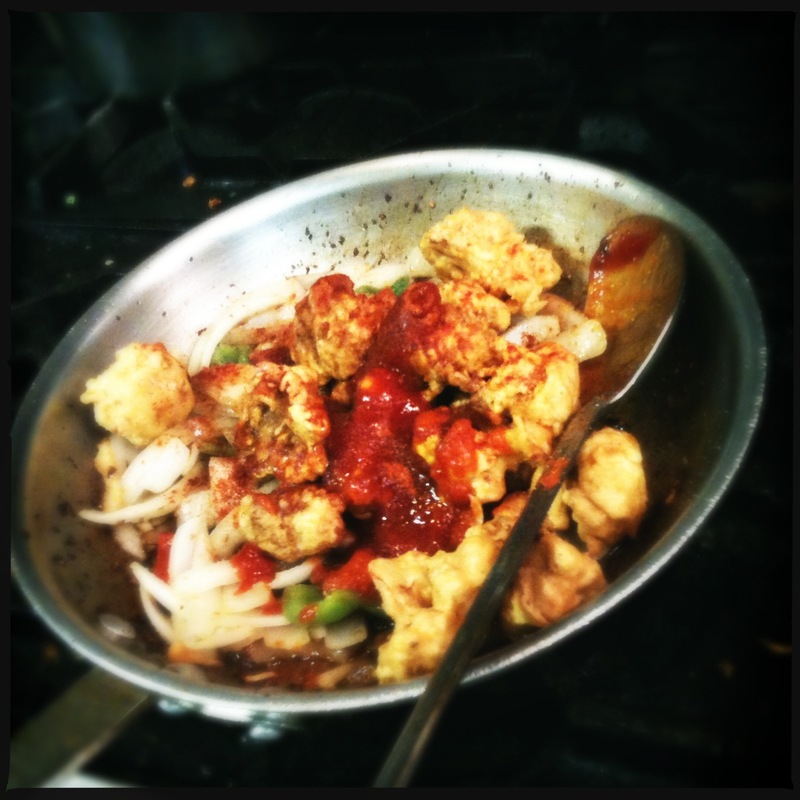 The cauliflower is fried, but using chickpea flour, so it’s perfectly light and delicate … then it’s tossed with sautéed vegetables and a spicy sauce … so you get the heat and spice, the punch of fresh ginger and the tang of the tomato and vinegar, the almost al dente texture of the cooked cauliflower, and the crispiness of the light batter. It’s wonderful. Start by slicing the vegetables you plan to use. 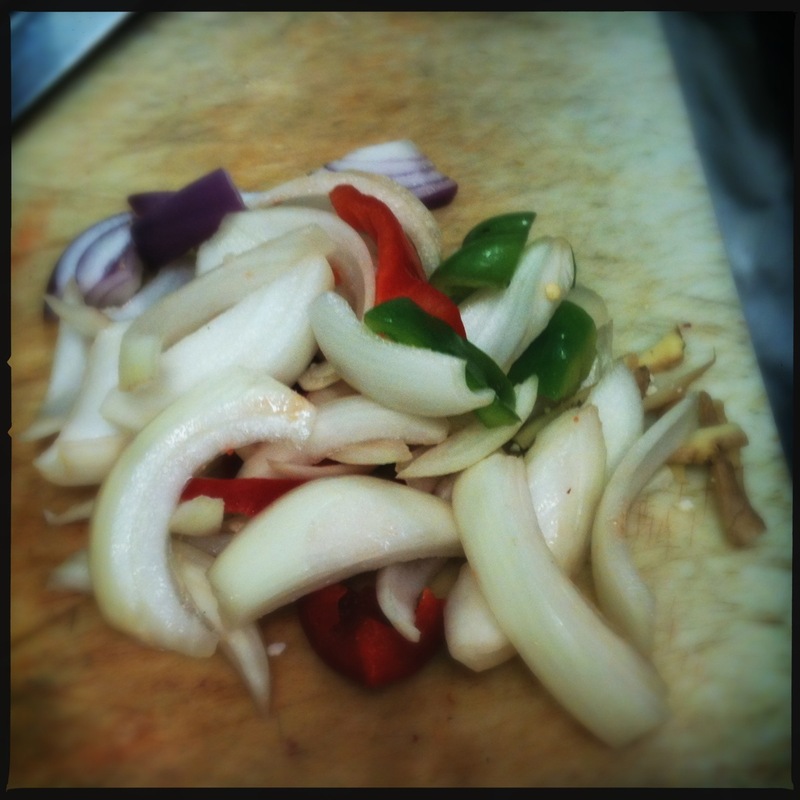 Surinder works in a fully stocked kitchen, so he already had all of his vegetables prepared, but he used (about) the equivalent of one half an onion, about 3 cloves of garlic and a 1/2-inch chunk of ginger root, and sliced them all together with a few chunks of red and green bell pepper. This was enough for a large dish made with a medium-sized head of cauliflower. 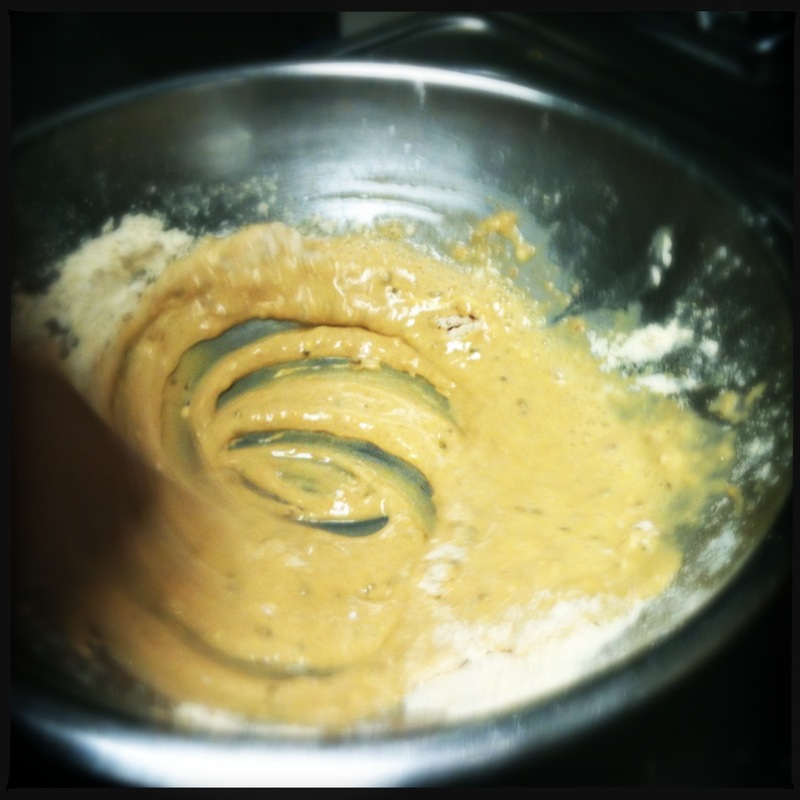 … very slowly, only a few tablespoons at a time, and blend with the flour mixture until the batter is thick and there are no lumps. 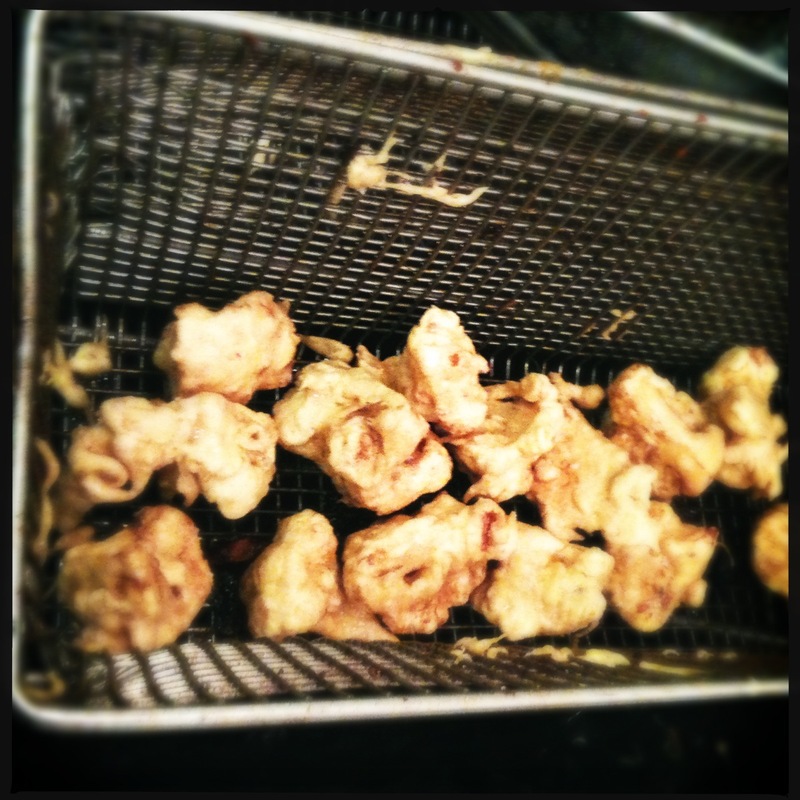 Coat each piece of cauliflower thoroughly and drop into hot oil. While the cauliflower is frying (about 5 minutes), start sautéing the sliced vegetables, ginger and garlic, with some good oil and a dash of cumin. 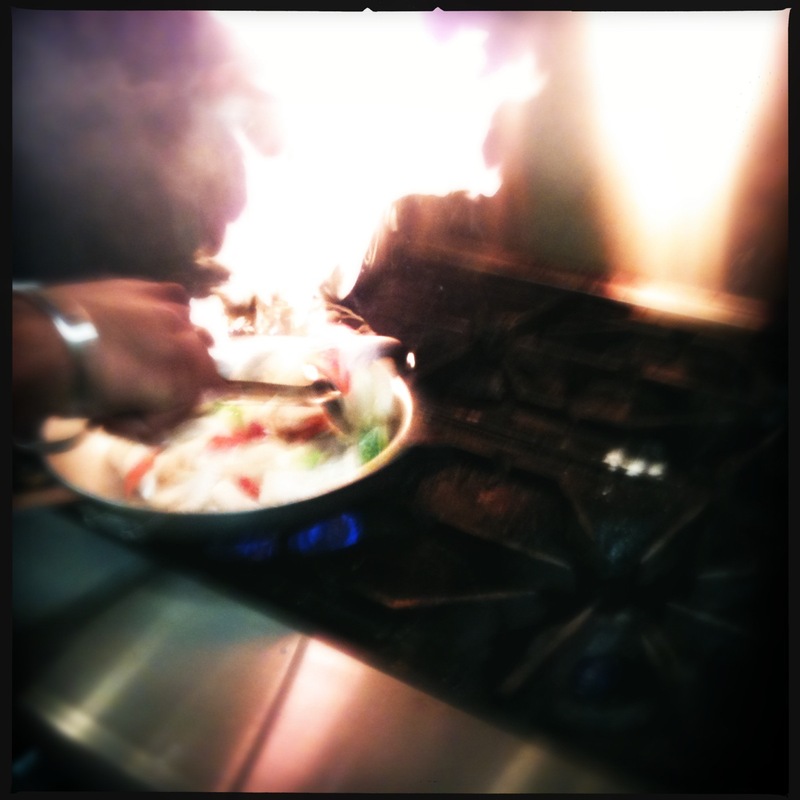 Cook over high heat until the vegetables are tender. By this time the cauliflower should also be golden-brown. Remove from the oil (drain slightly if you don’t have a basket in your fryer) and drop the florets into the pan with the sautéed mix. Then add about a 1/3 cup of tomato sauce, a dash of ketchup, a splash of soy sauce, a glug of vinegar and a shot of lemon juice (you know, approximately). You want enough liquid so the cauliflower is coated but not soaked. Continue to toss all ingredients together and make sure the florets are coated thoroughly. Dress it up on a plate, garnish with cilantro or parsley, and serve hot. This is truly an incredible dish. You can adjust the heat to your taste, and even if you are a hard-core meat-eater, you won’t be lonely for meat when you eat this hearty, spicy, crispy but soft, delectable dish. As you can tell, I really love Indian food. Even the spicy stuff. Living in the South for a long time gave me a great appreciation for the proper use of extreme spice and heat. To me, when you fry a chicken wing and instead of, you know, seasoning it, you just literally drown it in a vinegary hot sauce, it ruins the whole thing. Why impart all that heat for no reason? If I am going to finish the second half of my meal with a tissue in each hand, watery eyes, runny nose and singed taste buds, I want to taste it. If that heat and spice comes with actual flavor, I am all for it. If it’s just there to burn my face off and disguise the fact that you can’t cook, you can keep it. 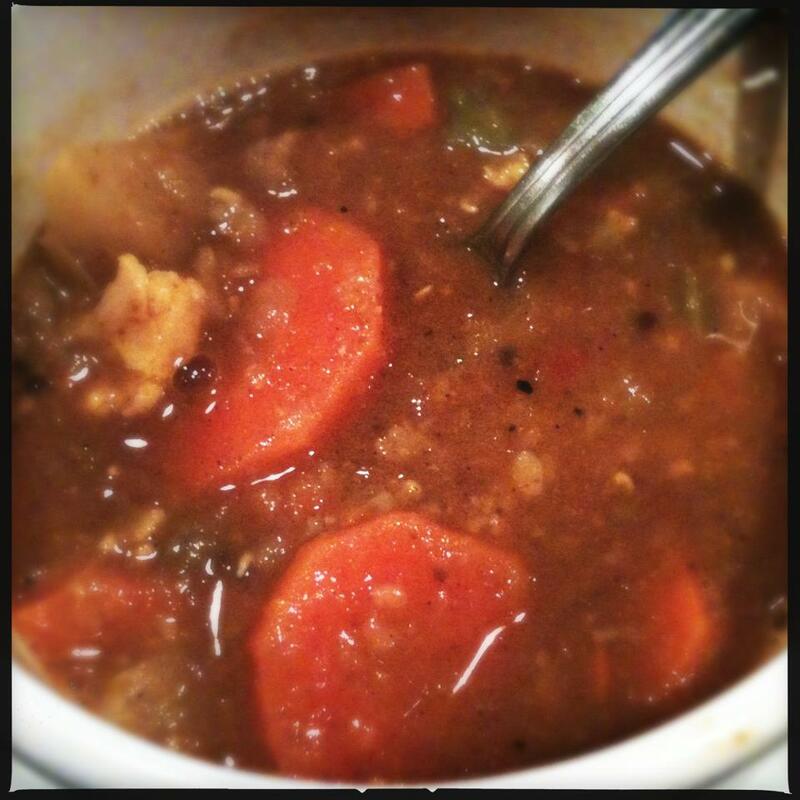 Sambar soup is a great example of a helluva spicy soup, but it has so much soul, texture, depth and flavor, you won’t mind, even when your eyeballs start to sweat. It’s another amazingly adaptable vegetarian dish, but if you like you can also add meat. 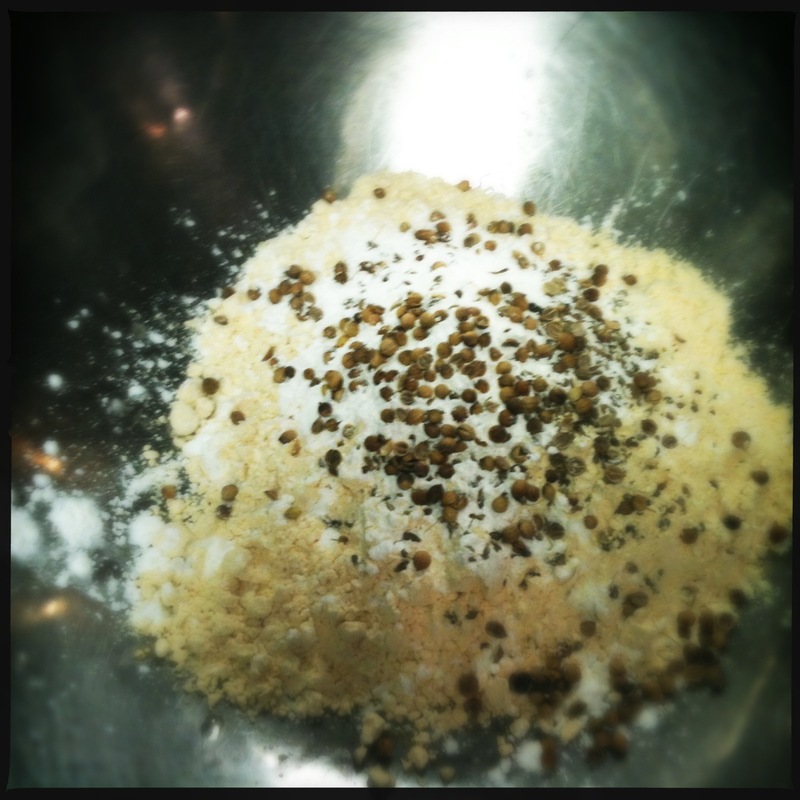 The idea is to blend together certain spices and then add whatever vegetables you have on hand. At Urban India, Surinder purchases a sambar soup spicy mix (like this one) and packs the soup full of lentils, potato, carrot, cauliflower, onion, garlic and more. From what I understand, very few people mix their own spices for this particular soup, but the soup mix from Matta’s contains Redgram dal (lentil) powder, salt, coriander powder, sugar, rice flour, tamarind concentrate, red chili powder, cumin powder, fenugreek powder, mustard powder, curry powder, turmeric and cinnamon. It’s spicy, but it’s amazing. 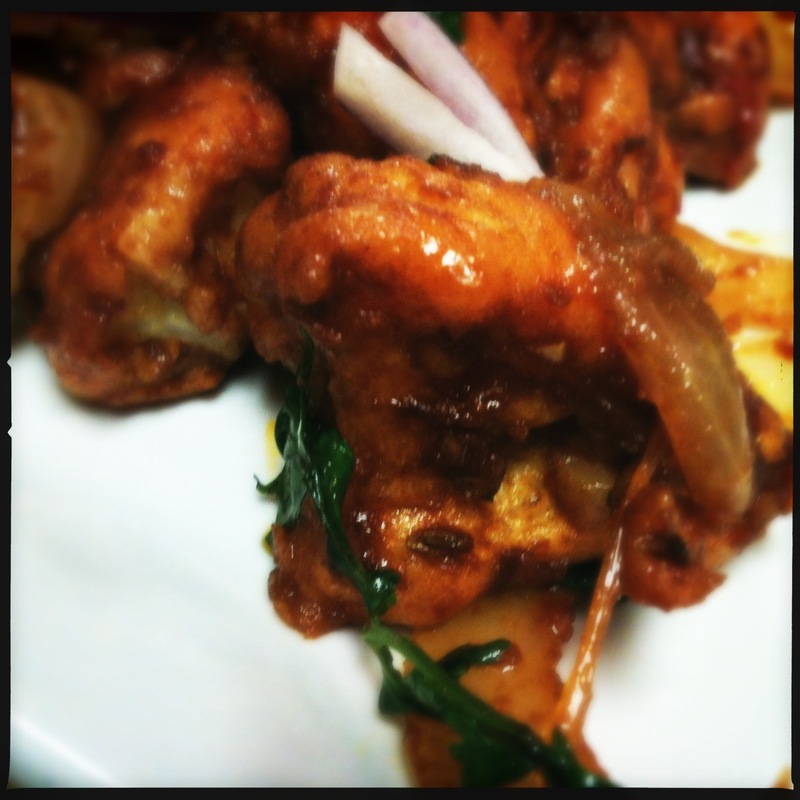 This entry was posted in cooking, food, Uncategorized and tagged cauliflower, gobi manchurian, Indian food, sambar soup, vegetarian dishes, vegetarian soup. Bookmark the permalink. ← Bored with the same cake? Turn that cake upside down!